Casio Altimeter Barometer Thermometer Watch presented in this post is Casio watch SGW300H, a true weather station on your wrist, with altimeter, barometer, and thermometer tools. The letters SGW here stand for ‘sport gear watch’. This is a great tool for outdoor and sport activities. It has separate sensors for pressure and temperature. There exist a huge number of altimeter watches on the market. However, in view of the price and features, no model can match Casio altimeter watch. 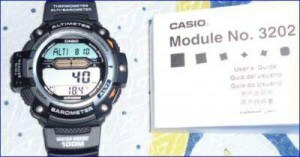 The current special Amazon price for Casio SGW300H is shown above. Altimeter measuring range is between -2300 to 32800 ft (or -700 to 10,000 meters). It is based on the built-in pressure sensor. I have tested it myself and can say that it performs great. Thermometer range is between -10 degrees to 60 degrees C (or from 14 F to 140 F), in the smallest units of 0.1 C (or 0.2 F). For the barometer, you can choose units of hecto-Pascals hPa (in units of 1 hPa) or inches Hg, inHg (in units 0.05inHg). The measuring range is 260-1100 hPa (or from 7.65 to 32.45 inHg). 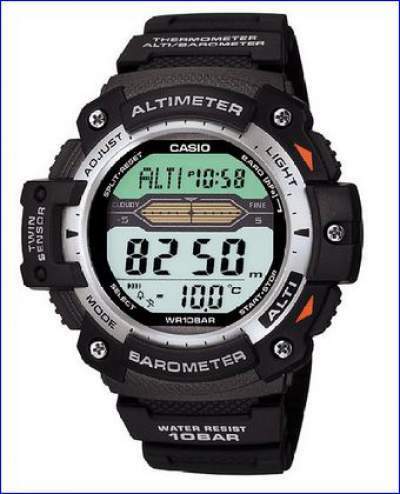 Weather prediction tool on Casio Altimeter watch. So when you stay at one place for several hours, measuring the pressure within such a time interval will show you the trend, and you may have some idea of what kind of weather you may expect. But I want to stress, this is not a GPS gadget, it will work fine if you adjust it when you have a chance to do this, i.e., compare its measurements with some signs which you see along your hiking route, like the altitudes of huts, etc. Positive face with dark-on-light numbers for easy reading. Stainless steel screw-in caseback and 100 meters/330 feet water resistance. The side buttons are pleasant and easy to use. I myself have this watch and I have tested all three functions (barometer, altimeter, thermometer), and I can confirm they work very good. 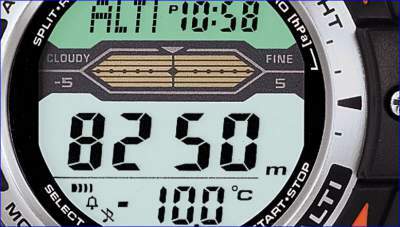 The altimeter measurement, of course, depends on pressure, so to have correct values it is essential to calibrate it when pressure changes and before you go outdoor. Calibration is rather straightforward and nicely described in the booklet which comes with the watch. The same comment on calibration holds for the thermometer, it is easily done within just a few seconds. Here on the right, you can see my own Casio watch SGW300H together with the thick booklet. The watch is in the altimeter mode, so it shows my present altitude of 40 meters above the sea level, and you may see the temperature as well. But I must say, I paid much more for it. I bought it in Decathlon, here on Tenerife, for 85 Euro. It was the last piece of this model which they had. This was far more than the Amazon price, so not a smart move. But the delivery to Tenerife of items purchased online is complicated and costly. Well, I am one of the users. So, I used it yesterday during my hiking in Anaga region of Tenerife. I started from the sea level in Santa Cruz, where I calibrated the altimeter to zero. It was a pleasure to see it working nicely during my hike. My highest point was around 800 meters above the sea, and I was able to compare it with maps. It worked perfectly. The same was with the thermometer, it was warm in Santa Cruz, but a bit chilly in the hills above Chamorga in Anaga. This was all registered on my watch. This is an addition several months later. I was in Austrian Alps and I was really happy to have this watch. It was due to an unpleasant episode in Otzal Alps. I was on my way toward Similaun hut when I was caught in a bad weather, with cold rain, in clouds, and visibility of only a few meters. Only due to my watch I knew that the hut was close because the watch was showing my altitude, and I knew the altitude of the hut. I also knew that the watch was working correctly because I compared its measurement of the altitude with the altitude of the Martin Busch hut, which I passed on my way up. Indeed, the Similaun hut appeared suddenly in front of me, you can see it if you visit my page about climbing Similaun. 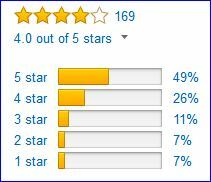 Rating of the Casio altimeter watch by Amazon customers. From what I have seen on the Internet, users’ experience with this tool has been mainly positive. But it appears that some expect too much from this nice but simple tool. They tend to forget that it must be calibrated to work properly and that it works with a pressure sensor, which depends on weather conditions. Here on the right, you can see how Amazon customers rated Casio altimeter watch. This is not a GPS, must be calibrated before setting off. It may not be very accurate in some weather conditions. If you have enjoyed this article and find it useful, please feel free to share it socially for others to read. Please leave your comments below, I shall be happy to read them. Have a nice day. Wow, this thing seems completely badass, hahaha. I wouldn’t mind owning one. It’s a decent price and it seems like it could come in handy for certain situations. Thanks for your incredibly informative review and I’ll be sure to check it out. Your content is very easy to read and your site looks pretty good. All the best! Thank you Michael. You are right, this is a great price for a watch with so many functions. All the best to you too. The Casio SGW300H seem like it has a very fair price when it comes to its pros and cons. You mentioned that you have one. When buying a watch I take the lifespan of the watch to be the most important especially when I spend over $20. I was wondering how long you have had yours? or how well it has kept? Hi Tom, I would not worry about liefspan. I have this watch for about 7 months now. But I still have another one (different model) bought in 2006 and it still works with the same batteries. Hard to believe even for myself but this is a fact.